Many thanks for the lovely email containing your condolences. 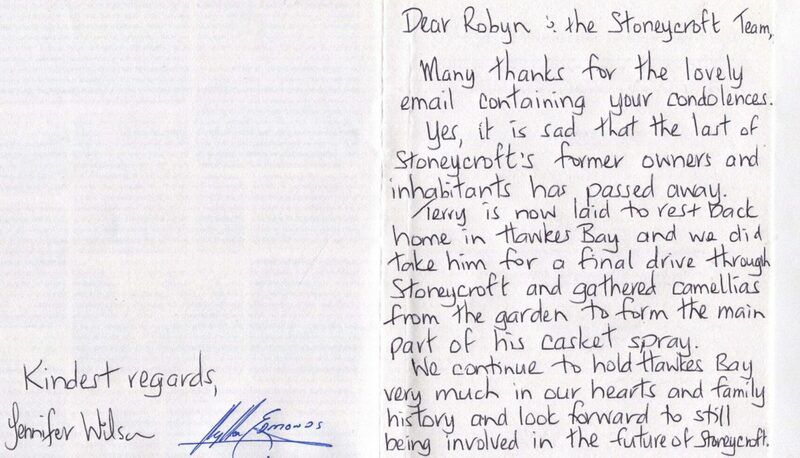 Yes, it is sad that the last of Stoneycroft’s former owners and inhabitants has passed away. Terry is now laid to rest back home in Hawkes Bay and we did take him for a final drive through Stoneycroft and gathered camellias from the garden to form the main part of his casket spray. We continue to hold Hawkes Bay very much in our hearts and family history and look forward to still being involved in the future of Stoneycroft.